Home / Metro News / Meet The UBA Security Guard That Returned N3.5M: "I Squat With My Brothers"
Meet The UBA Security Guard That Returned N3.5M: "I Squat With My Brothers"
At a time when people were bemoaning the current economic realities, when the value of the Naira was eroding faster than the speed the light, when prices of household commodities have hit the roof, when almost all the economic indices were in the negative. A security guard with Technocrime attached to UBA on a salary of N30,000 who saw a wad of $10,000 equivalent of N3.5M. (a quick maths will tell you it would take him 10 Years to earn that amount), decided against the common instincts of keeping the money to returning it. The gesture has not gone unnoticed as the Chairman of UBA, Mr Tony Elumelu, in rewarding the rare show of honesty and integrity grilled into one invited him to his office where Ibrahim met with some board members and senior staffers of the Bank. It also earned him a commendation letter from his office Technocrime Securities. 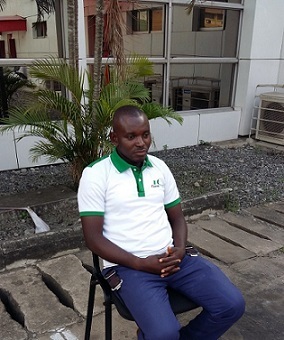 Here is an excerpt of the interview Mr Ogbanago Muhammed Ibrahim, A rare person, A security man with a heart of gold who deserves more than just mere mention on the internet had with Naijabankers.com correspondents. Q: What prompted your course of action? A: By the Grace of God. I am a honest and sincere Muslim. I believe that a good name is better than riches. I saw the money just by the gate. I brought it inside our office. 20% of me wanted to keep the money. The remaining 80% didn’t want to. Eventually i took the money to the Branch Manager Funmi Ojuile. She was surprised and was full of praises for me over what i did. Later the man who came to withdraw the money came looking for it. He prostrated on the ground for me and prayed for me on hearing what happened. He was only an employee asked to withdraw the money, which was part of the total withdrawals made from the company’s account that day. The man was almost in tears saying he would have been locked up in Kirikiri had the money not been found. He added that the education of his 3 children in the University would have suffered a great deal. He told me he had no money to give me, but prayed that his God would reward me. Q: Tell us about your meeting with the Chairman, Tony Elumelu. It must have been very rewarding? A: I must confess that is the highest point of this whole episode. You will agree with me that seeing an influential man like the Chairman does not happen easily. How many managers even have the privilege of seeing him let alone given the sort of attention and reception he gave me. I did not only meet him, but i met with the board. He asked me to address them, and that was worth more than anything for me. Q: (Cuts in) ...it must have been financially rewarding as well? A: (SMILES) I laugh when people imply that or ask me that question...The Chairman rewarded me in ways far beyond my expectation. I’d rather not go into details about that. I am eternally grateful to him. It was all over the social media with some from his handle. Q: Do you feel adequately rewarded and compensated? A: I did not do it to be rewarded. However, I feel very well appreciated. I have been receiving calls from all over the place. Infact my HOD at Kogi College of Education called me recently and told me how proud of me he was. So also many old friends of mine and relations have been calling me. I have been granting interviews upon interviews. I may not have money now. But i have a good name. My name has gone far beyond where i can easily get to. That to me is more than any financial reward. My God will bless me with my own riches. I am a devout Muslim. I would never touch another man’s money. Q: Would you tow the same line if you stumble on this kind of money again? A: I would do exactly the same thing...I believe a good name is far better than riches. Q: How does your company, Technocrime Securities feel about the news? A: They are very excited. I got a commendation letter from them. A: (SMILES) I am not married yet. I am still looking for money. I know i ought to have been married, i have younger ones who are married and are doing well but i will soon. A: I am old o...I am 29 years old. I was born on July 5th. Q: Wow...Just Yesterday...Happy Birthday in arrears. Q: Don’t you think the money you returned could have been handy in getting you married? A: (LAUGHS) Maybe, maybe not...but I would rather raise my money in honesty... This reminds me of the question the Chairman asked me, when i told him my salary was N30,000. He said “Do you know that it will take you 10 Years to earn that amount”. I believe i would make my money clean. I did not do it for financial rewards. Q: So your current salary is N30,000? A: Yes...I’m on a monthly salary of N30,000. Q: Where do you stay? And how has this affected you in your neighbourhood? Q: You don’t have a place of your own? A: No. I squat with my brothers. Q: What was their reaction to the issue, knowing that N3.5M is more than enough to get you a place of your own? A: (LAUGHS) They are very happy. My brothers know me...I have always been a man of integrity. They would never involve me in matters they know will question my integrity because they know what my reaction would be. So they were not surprised when they knew about it. Q: As a graduate of NCE, Have you tried getting a teaching job? Don’t you think your job as a security man is below you? A: Well...It is. You know the economic situation in the country. I actually got a job with a private school in Egbeda which was to pay N18,000 per month. You and i know that would not take me anywhere. If it were a government job, i would gladly take it and start building a career off it. So i opted for this. I am believing God for a better job. Q: Do you have a word for the youths out there who would rather take to vices than this humble route you have taken? A: The youths have to realise that we have a lot to do to better the lots of this country. The image of this country has to be redeemed. The world should know that we are honest people. A good name name is better than riches. I believe that there are 3 routes to popularity. One, is through political office, second is through criminality and the third is through good deeds. And i choose the third. I am happy and fulfilled seeing my names all over the internet, in the papers, on TV, hearing it on radio and it’s for a very good deed.